Work will continue today to improve the debris catch fences on the slope above the road following last week’s multiple landslides. Conditions on site will be carefully monitored throughout the day with the decision taken late afternoon to consider keeping the Old Military Road open overnight if it is safe to do so. Multiple experienced teams including rope access personnel, geotechnical engineers, specialist machinery operators, BEAR Scotland Operations teams and heavy plant contractors are working to prepare the area to reopen once considered safe. 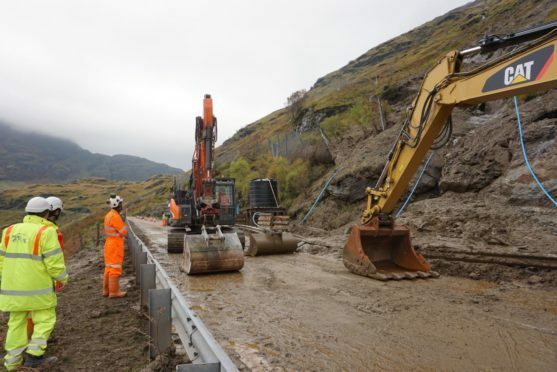 Eddie Ross, BEAR Scotland’s North West Manager said: “The geotechnical inspection this morning has allowed us to reopen the Old Military Road through the Rest and Be Thankful, providing an alternative diversion route with improved journey times for road users in and out of Argyll.